For the stoppers I found some nice silicon bottle stoppers at woodcraft.com when I was in Texas on a business trip. Unfortunately I haven’t been able to find anywhere to buy these in Australia — ebay, aliexpress and Carbatec have all let me down. If someone knows where to get these, I’d appreciate a pointer in the comments. I’d recommend using a food safe finish for these, just because it is food on the inside of the bottle. I used U-Beaut Food Safe specifically, which is a mineral oil. I turned a whole heap of these stoppers and then let our Christmas victims pick which ones they liked. As part of that I wanted to be able to clearly state what each stopper was made out of, so I stored them in a divided container. 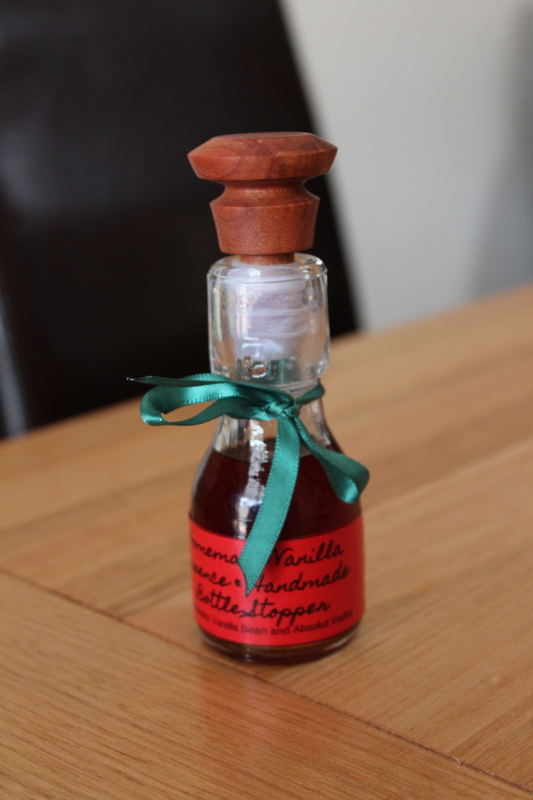 My wife came up with some nice labels for the bottles. We applied those just by painting on PVA glue, placing a paper label and then painting PVA over the top. The PVA dries clear and the labels look super good. Surprisingly to me, gluing silicone isn’t as easy as I thought it would be. When I stop to think about it, I should have planned this part better. It turns out we use silicone all over the place because its hard to get it to stick to things — think silicone bakeware or cooking utensils. Thus, gluing the silicone stopper attachment to the wooden handles was a bit of an adventure in itself. There are specialist silicone glues available, but none that I could find a supplier for in Canberra the day before Christmas. Instead chatting to Steve Walsh and some googling seemed to imply that some CA (super glues) would work, or that Araldite might be another option. Overall it worked out well! 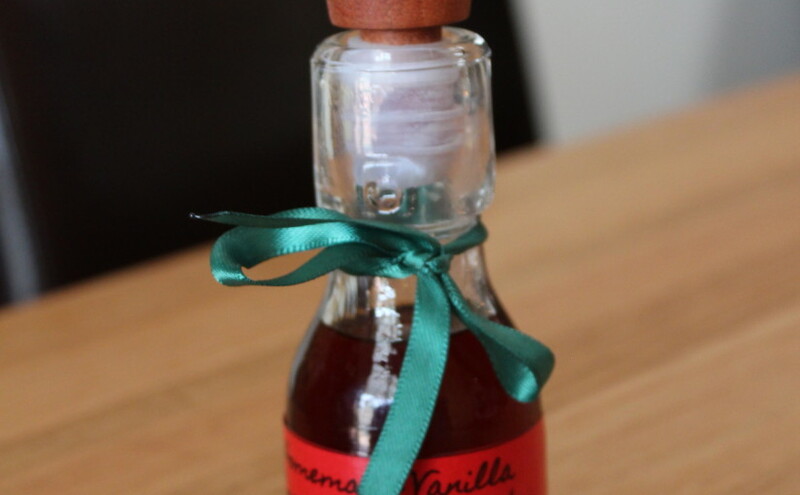 Our finished home made Christmas vanilla essence with turned stopper. You can see better pictures of the individual stoppers in the December turning wrap up post. I’d be interested in what people think of posting YouTube videos like this instead of just pictures. It was a fun experiment, but also a fair bit of work so I am not sure how often I will do it.